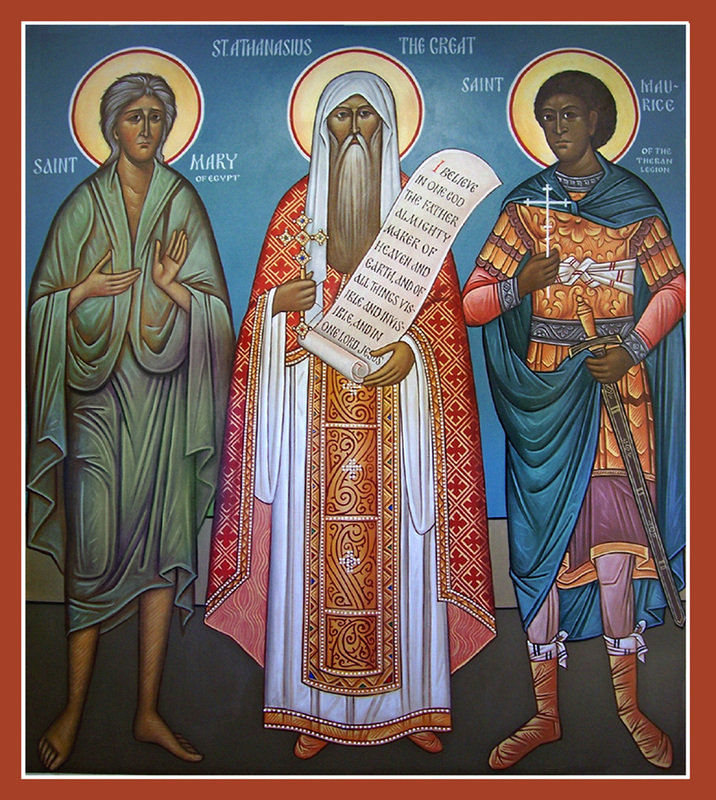 St. Innocent Orthodox Church - Why Saints? The veneration of saints is vital to the life of the Holy Orthodox Church, because the existence of saints affirms that it is truly possible to fulfill the Christian vocation — to become conformed to the image of Christ. Every Christian is called to be a saint: Christ commanded us to be perfect as our heavenly Father is perfect. The saints worked hard to achieve that spiritual perfection, and are the Church’s Olympic champions — gold-medal winners. They cooperated with God in doing His will, and allowed the Holy Spirit to fill them and use them. They achieved this blessed condition through their great spiritual exercises: by prayer, fasting, abstinence, repentance, receiving the Holy Mysteries (sacraments); and by living lives of simplicity. The veneration of saints is vital to the life of the Holy Orthodox Church, because the existence of saints affirms that it is truly possible to fulfill the Christian vocation — to become conformed to the image of Christ. Every Christian is called to be a saint: Christ commanded us to perfect as our heavenly Father is perfect. The saints worked hard to achieve that spiritual perfection, and are the Church’s Olympic champions — gold medal winners. They cooperated with God in doing His will, and allowed the Holy Spirit to fill them and use them. 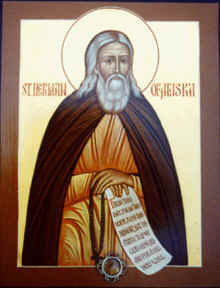 They achieved this blessed condition through their great spiritual exercises: by prayer, fasting, abstinence, repentance, receiving the Holy Mysteries (sacraments); by living lives of simplicity, humility, love, patience, purity and obedience; by reading the Bible, the Church Fathers, the lives of the saints; and most especially, by allowing God’s love to overflow through them to all creation. 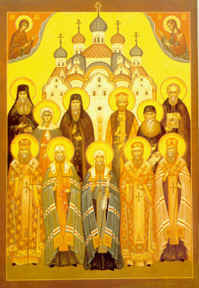 The saints (such as the newly-glorified Russian saints depicted in the icon to the left) dedicated their lives to loving God above all else, serving Him according the talents they received. Their "job descriptions" varied, but they always served the world around them — as simple lay men and women and as princes and princesses; as monastics, priests and bishops and as writers, translators, artists and missionaries; as spiritual directors, healers of body and soul, wonder-workers and as "fools-for-Christ." They persevered and endured much to acquire the gifts of the Holy Spirit — to become humble, patient, kind, gentle, joyful and peaceful — their hearts on fire with divine love. The saints were given the spiritual vision to see God’s activity in the world around them, to see the icon of Christ within each human being, and to be continually aware of being in God’s Presence. They truly lived the transfigured and resurrected life to which we are all called. When pain, sickness, disappointment, sorrow and suffering occurred, the saints endured it with patience, with firm trust in God’s love and holy will. They allowed their trials and tribulations to be a means of achieving purity of heart, so that they might see God and become ever more like Him. 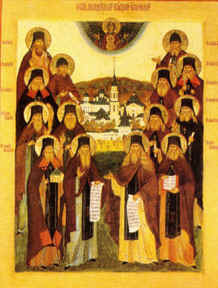 The saints were human beings like us, and achieved what we all are supposed to achieve, as did the recently glorified elders of the Optina Pustyn/Monastery (icon to the right). There are countless thousands of saints known only to God, but those whom we do know to glorify as saints are role models for us, showing us how to live the Christian life of working diligently to acquire the Holy Spirit and to be conformed to the Image of Christ. The saints also are eager to help us with their prayers and frequently intervene on our behalf. Because of their pure and holy lives, the saints frequently were given spiritual gifts of healing, clairvoyance and powerful, effective prayer. Often the saints were "Wonder-Workers" — they worked miracles — both before and after their falling asleep in the Lord. Sometimes their bodies participated so much in their holiness, that after death their bodies remained "incorrupt" (their flesh never rotted). Countless miracles have occurred as a result of touching the holy relics (bodies) of the saints. The presence of the saints around us is a profound blessing. As we get to know them more, they can become our friends, and we can turn to them to help us overcome problems. They can help us to achieve our Christian calling to become saints — that is, to be filled with the Holy Spirit, to live resurrected and transfigured lives, to dedicate our lives to serving God, and to become living icons, conformed to the icon of Christ within us.